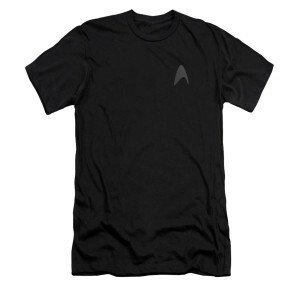 Command the fandom with the simplest of styles when you don the Star Trek Black Command T-Shirt. The Soft black tee features the Starfleet emblem over the left breast in grey for the perfect nod to Starfleet uniforms that fellow fans are sure to enjoy. I've received so many comments and smiles when wearing the shirts from people I casually meet while out and about. They have really held up to the wear and tear of almost daily use. The color has stayed crisp in spite of the local hard water. I'm happy with the product. Worn these shirts to movies, to sleep in, around the house, etc. As stated above, great shirt, very trendy. Star trek insignia on the chest should stand out more pronounced. Also, could be gold or, silver. Asked for a large, got a large! Even after washing it it stayed the same size! Looks great, subtle. Love it! The screen-printed logo is very subtle and low quality. By low quality, I mean that it is that the logo appears to be "fuzzy" looking rather than crisp and clean. I just had higher expectations for a trademarked product. A lifetime Trekie. Love the shirt. Great fit. Good quality.